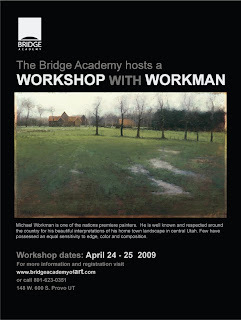 I spent 2 weeks with Michael Workman in Texas last year. He is an amazing teacher. I hope you enjoy the class. I am a fellow artist who has been searching for the painter whose work knocks my socks off. Michael Workman's art does just that. Would you mind telling me how you found out about his workshop? Where it is located? And Please blog about it, I am sure others would be interested to read about your experience. Wishing you the best at that workshop.